The recently concluded Adstratworld Foundation, Inc. (AFI) Golf Tournament for-a-cause held at Villamor Air Base Golf Club last July 1 was indeed a blessing that exceeded our expectations. Tee-off was scheduled at 11AM and yet as early as 9AM troupe by troupe of golf enthusiasts came flooding the registration area. A simple awarding ceremony with a little fun and entertainment followed at VABGC Social Hall where every attendees’ eyes glittered with happiness as each winner march towards the stage for their awards and raffle prizes. One big moment during the evening fellowship was the presentation of AVPs of AFI’s scholars who each gave their hearts out acknowledging and thanking everyone for extending alms to them. The night was capped with everyone going home feeling fulfilled and accomplished knowing they’ve been an instrument to one great deed. We would like to extend our sincerest thanks and appreciation to our sponsors who supported us in this endeavor: Megafiber, Massimo Philko, Chooga Juice, Healthy Family, Longga Taps, Bear Beer, Pascual Laboratories (C-Lium Fibre), PharmaRex (Cortal Pain), Anischa Salon & Cafe, Dyna Drug Corp (Checkhup), Novuhair, Timberpro, Asiatravel.com, JB Sports, Anagen, Sante Barley, Goldilocks, Ayala Land Premier and Cathay Land (South Forbes). Also, to our media partners who helped us spread the news: When In Manila, Philippine Daily Inquirer, Impact Golf, GolfPH.com, PinoyGolfer.com, The Manila Times, Business Mirror and BusinessWorld. Adstratworld Foundation, Inc. headed by Mr. Dei Callao was overwhelmingly happy with the turn-over of events and the words ‘THANK YOU’ are not enough for these people who have unselfishly shared their blessings to the AFI’s scholars. More than 25% of our country is living in poverty. When is that last time we’ve felt grateful for simply eating 3 times a day, sleeping on a comfy bed, or even breathing properly? A quarter of our nation wishes to have that ability everyday. This July, you can take part in helping to give them that opportunity by joining Adtsratworld Foundation, Inc’s (AFI) 2nd Charity Golf Tournament and golf not only for your enjoyment, but golf for a cause! 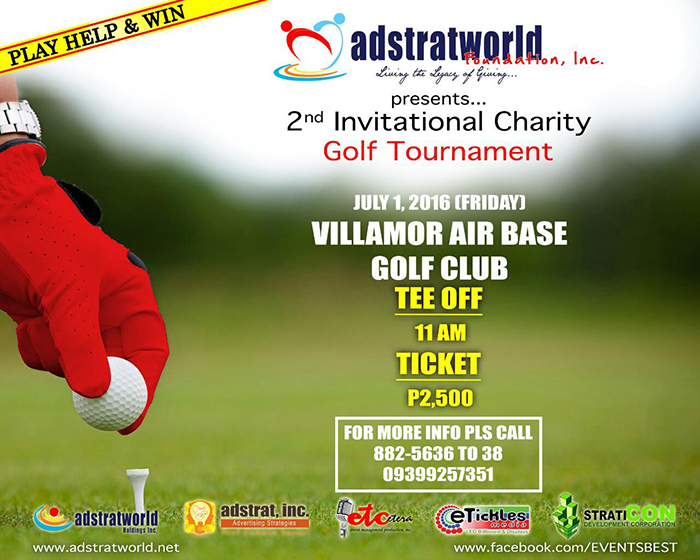 Mark your calendars for a fun-filled day on July 1, 2016 at the Villamor Air Base Golf Club. What Is Adstratworld Foundation, Inc? The Adstratworld Foundation, Inc (AFI) exists for 2 simple but powerful purposes- to implement sustainable programs and projects that will help communities and its people especially the youth, and to transform and improve communities and be able to create opportunities for them. As they are in their continuous pursuit to fulfill its mission and vision making things happen that will spell a difference to its benefactors, AFI has also considered extending a little aid to less fortunate Pinoy artists whose glorious years of fame have passed and are now confronted with health and financial difficulties.